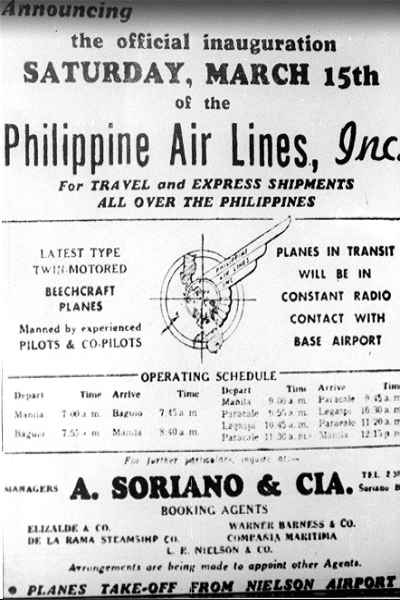 March 15, 2011 marks the 70th anniversary of the first-ever Philippine Airlines flight, which flew from Makati to Baguio City, from the Nielson Airport. Lorrie R. Nielson and a group of Manila-based foreign investors constructed the port’s control tower and landing strips that served as the first modern commercial international airport of the Philippines from 1937 to 1947. The principal runways of Nielson were built by 1,000 men and are now two of Makati City’s main roads: Ayala Avenue and Paseo de Roxas. Nielson Tower is the architectural legacy of Nielson Airport and is one of the important built heritage structures in the Makati Central Business District. Using the principles of adaptive reuse, the tower’s original structure had been preserved. Today, the Nielson Tower houses the Filipinas Heritage Library, a one-stop, electronic research center dedicated to promoting Philippine studies, history, culture, and the arts. Source: Kuwentong Ayala vol. 11 no.3, November-December 1980, pp. 2-4.